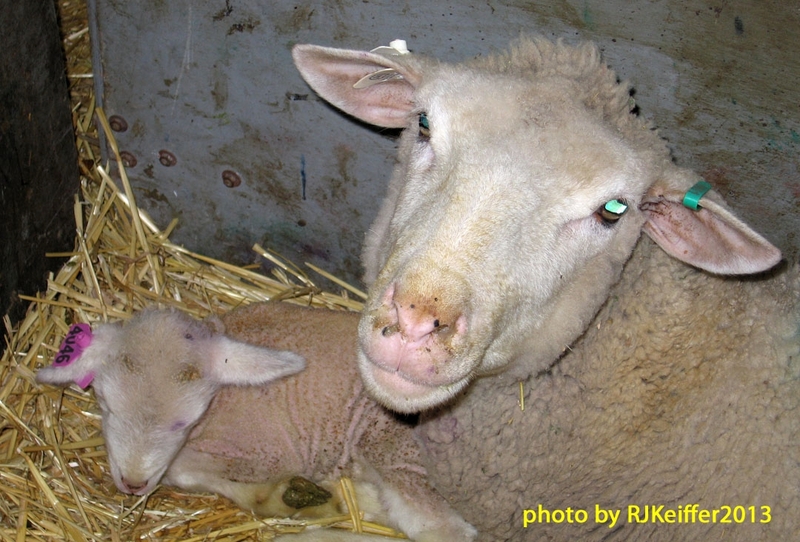 Normally the UC Hopland Research & Extension Center does not begin with lambing until January. This year, however, due to a research project by the UC Davis Large Animal Clinic, lead by Catalina Cabrera and Bret McNabb, HREC has bred for "staggered" lambing... resulting in some early lambs. Utilizing 260 ewes of the Center's range sheep flock, the research group is comparing combinations of the use of the recently-approved intravaginal progesterone device (CIDR), the ram effect, and the hormonal enhancement of PG-600. The overall goal is to induce the onset of cyclicity and alter reproductive efficiency. Some lambs have already been born as a result of this project design ...and this is a photo of one of those lambs and its mother ewe.